This month we take a look at one of Hollywood’s most versatile leading men: Christian Bale. Bale celebrates his birthday in January, and we celebrate his diverse and at times strange filmography. Christian Bale’s breakout role in Mary Harron’s 2000 cult masterpiece American Psycho is, to me at least, his strongest performance by a wide mile. Bale plays Patrick Bateman, the yuppie serial killer subject of the film first conceived by Bret Easton Ellis’ scathingly satirical and violently controversial novel of the same name. Bale brings Ellis’ monstrous creation to life, mimicking the character’s deadpan, insincere monologuing about fashion, music, and murder all in the same breath, along with his increasingly frequent homicidal outbursts. Bale allegedly based his interpretation of Bateman’s character off the enigmatic persona of Tom Cruise, being especially enamored by the actor’s “intense friendliness with nothing behind the eyes”. Equally hilarious and horrifying, Christian Bale’s interpretation of Patrick Bateman lays much of the groundwork for Harron’s film to function as the bitingly brilliant adaptation that it is. Whether reciting hollow pop music criticism, outright describing his sadistic impulses to his apathetic coworkers, or manically hunting a prostitute down the empty hallways of his apartment complex, Bale gives a career-defining performance that dives so enthrallingly deep into a deranged psyche that it’s impossible to ever look at him the same afterwards. There’s something so uncomfortably hysterical and especially captivating about watching Bale in this role that finds me continuously drawn to revisiting American Psycho at least once a year. Bale’s performance in The Machinist arguably defines his commitment to his craft. His appearance is striking and yet disturbing. It is said he lost 63 pounds in weight dropping from 173 pounds to around 110. He achieved this by eating a can of tuna and an apple a day whilst also making the decision to take up smoking in order to diminish his appetite. 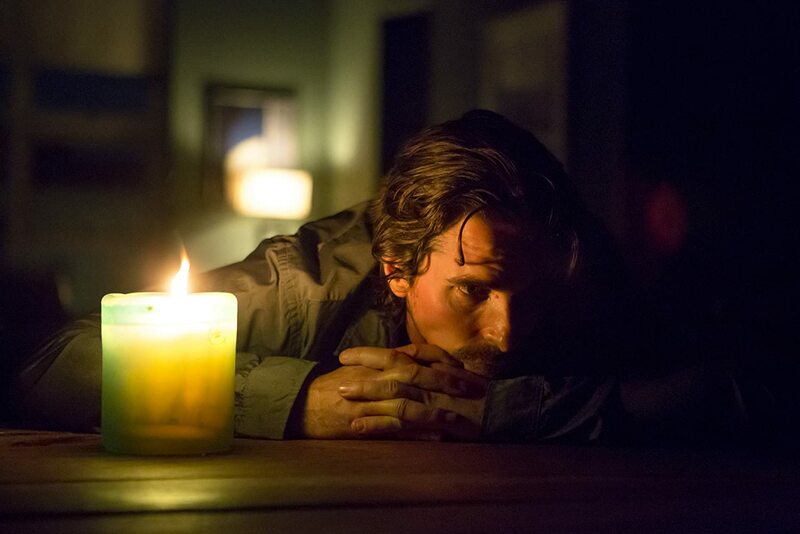 Audiences may argue whether this contributes to acting or not, but preparing for a role is part of an actor’s job and this is something Bale has always had utter dedication to. What is even more astonishing is Bale’s next role following his performance as Trevor Reznik in The Machinist was as Batman/Bruce Wayne of which he regained the weight (and more) for. Christopher Nolan’s psychologically-challenging take on the world of stage magicians had stiff competition in Hollywood throughout 2006, yet still manages to remain a blistering and memorable affair thanks to its gripping plot and game performances from both Hugh Jackman and Christian Bale. Bale’s work is mostly left unnoticed throughout much of the film’s runtime, and more often than not his performance seems tonally inconsistent- crackling with a fiery intensity one minute and driven insane by his insecurities onstage the next. Bale’s Borden not only encapsulates the feeling of obsession, but the build up and harsh effect it has on those around you… not that far off from the intensity of his meltdown on the Terminator Salvation set, only this time it’s deliberate and put to better use. 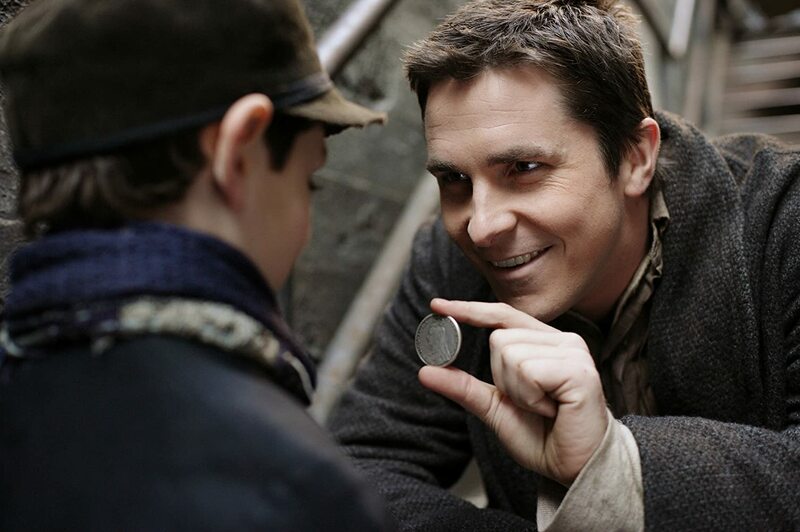 Whereas many other films have demanded physical as well as mental changes from the actor, The Prestige asks him to go about unnoticed; it’s only when the film’s plot allows this that his genius is discovered, hidden away behind the falsities of the tricks of the trade. Nolan has stated that Bale wasn’t his first choice for the role of Alfred Borden, though now looking back it’s difficult to see anyone else tackle the reigns of a struggling magician locked in a battle for supremacy. I saw The Fighter before I became interested in film, and moreover independent film, and so a film that boasts a cast of Mark Wahlberg, Christian Bale, and Amy Adams wasn’t really anything of note to me at the time. All movies I saw, being Hollywood films, featured A-list actors and often more than one. It was rare for me to notice acting in films, but The Fighter was an exception. The film sees Mark Wahlberg at his best but his performance, to me, is outshadowed by that of Bale’s. And that evidently didn’t go unnoticed as Bale won the Best Supporting Actor award that year at the Oscar’s. Like for The Machinist, Bale had to lose a considerable amount of weight to pay boxer Micky Ward’s older half-brother Dicky Eklund. Dicky was also a boxer, but experienced a fall from grace after becoming addicted to crack. At the start of The Fighter, HBO is filming a documentary about Dicky that he believes is about his “comeback” (not a fictionalized part of the script- High on Crack Street: Lost Lives in Lowell is the name of the documentary), but it’s clear to everyone else except Dicky that it isn’t his ‘comeback’ that HBO is filming. It’s his fall from grace. To embody Dicky’s character, Bale had to take on a Boston accent and emulate Dicky’s posture and mannerisms, which he does so well at it stands worth reminding since we forget sometimes: Christian Bale is a British actor, not American. And that makes his acting in The Fighter all the more impressive. Adam McKay‘s The Big Short tells the story of the 2008 US mortgage crisis perhaps better than any movie other than the business school favorite Too Big to Fail. 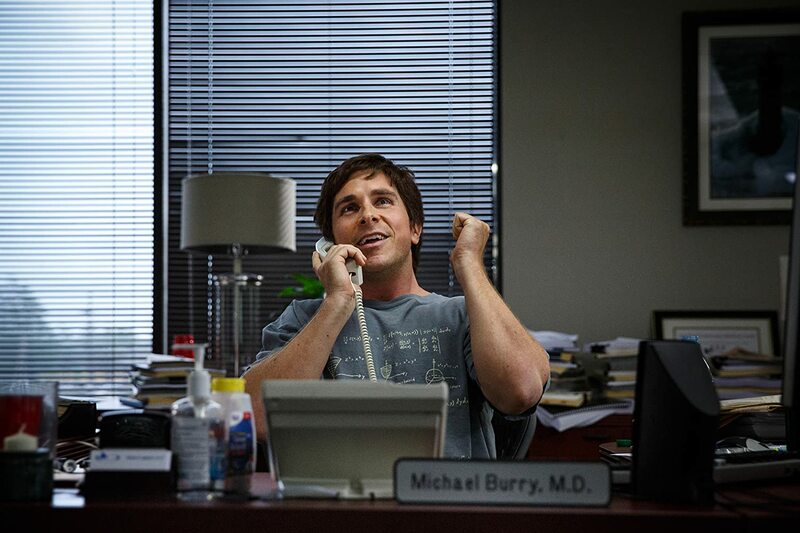 Bale plays Michael Burry, the bright young hedge fund manager who first begins to see the cracks in the housing market forming. His performance is eccentric and somewhat out of type. The film as a whole is a fun and stylish but surprisingly educational lesson in contemporary economics. The Big Short came out at a perfect time for me in that I was pretty fresh out of college and looking for my first job in corporate America. In early 2016 I got a phone call to interview for a job with a mortgage company. Knowing little about the industry, I watched The Big Short the night before my interview as part of my preparation. Though it didn’t paint a rosy picture of the American mortgage marketplace, it did make me feel confident in some of the basic terminology of the industry, and I wound up working for that company for over two years. I’ll always remember The Big Short as the movie that helped me get my first grown-up job. When considering acting in Terrence Malick films since The Tree of Life, Knight of Cups has the rare distinction that there is one lead actor and a myriad of minor characters as opposed to possessing multiple lead actors as do The Tree of Life (Brad Pitt, Jessica Chastain & Sean Penn), To The Wonder (Ben Affleck and Olga Kurylenko), and Song to Song (Ryan Gosling, Rooney Mara & Michael Fassbender). Christian Bale benefits entirely from this, his performance the central focus in Knight of Cups as he explores sights and sensations within Los Angeles and Las Vegas. His La Dolce Vita-esque journey is accompanied by six women who enter and exit his life as he falls in and out of love and explores his sense of identity and his family. Bale’s acting is almost entirely physical- but in a different manner than he typically exhibits in his body transformations- as he appears lost, empty, delirious, calm, and finally enlightened almost solely through the use of facial expression.